As last week’s Nor’easter reminded us, baby, it’s cold outside. Fortunately, Portland’s plethora of bars and restaurants offer hours of indoor entertainment. Drinking on an empty stomach is never a good idea (as hard lessons learned in college will attest), but many Portland bars tend towards $14 cocktails and $8-10 small plates to accompany them. A happy hour for two can quickly turn into a $100 meal—certainly not a sustainable pace until spring. Fortunately, even the grittiest bar is legally required to serve some sort of food. Specifically, Maine liquor laws require that “Class A Lounges must offer food for sale during all times they are serving liquor.” The law goes on to elaborate, specifically that salads, hamburgers, and hotdogs are in, but popcorn, chips, or pretzels are out. So two friends and I set out to explore the cheaper side of drinking and snacking through Portland. On a recent quiet Saturday night, couples at the Snug played card games and swapped real-life ghost stories. For a while, the Snug kept its customers satisfied with stiff drinks, soft pretzels, and black bean burgers. Back then—during what I refer to as “the Glory Days”—bar staff allowed customers to bring in slices from neighboring OTTO Pizza. Last December, the Snug’s owner Margaret Lyons revealed a relatively extensive menu offering vegetarian pub fare. We ordered mixed drinks ($6), but found that the expletive-laced menu was gone. My friend mourned the loss of the opportunity to consume an entire sleeve of Ritz crackers and a block of cheese in public. Undeterred, I ordered a soft pretzel, now made by South Portland bakery Little Bigs ($2), over the two tempting soup options: carrot ginger and creamy tomato with homemade croutons ($6). The pretzel was perfectly serviceable, salty and chewy, with a small side of yellow mustard for dipping. Buoyed by our success at the Snug, we plunged into the frigid November night air and headed through the quiet East End streets to Sangillo’s. Figuring we’d at least find sustenance in the form of Jell-O (shots), we were warmly welcomed into the neighborhood bar. Spying a hot dog warmer, we asked about the food options, and with a laugh, the bartender offered up a surprisingly diverse selection of Hot Pockets, corn dogs, and pizza. 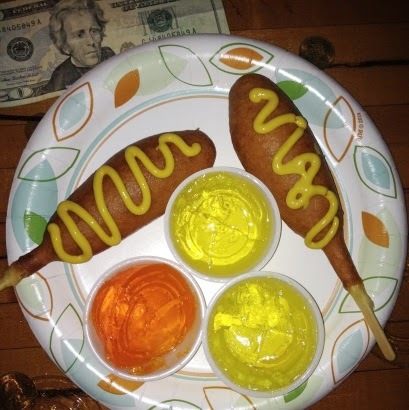 Figuring corn dogs pair best with tequila Jell-O, we went with two dogs and three shots, totaling $13. A squiggle of yellow mustard completed the package and before our systems could process what we’d done, we were back outside hailing a cab across town. Our first disappointment of the night came at Mathew’s, where we learned their cook was “out sick.” Portland’s oldest bar allegedly offers a small menu of hamburgers, chimichangas, and fried snacks like onion rings and jalapeno poppers, but admittedly no one’s there for the food. Our whiskey and ginger ales came in pint glasses for $7, and the friendly bouncer chatted with us while we sipped. But soon our hunger caused us to bid the sparse crowd at Mathew’s farewell. We prowled the Old Port, sticking our heads in bars and asking, “got any food?” We heard recommendations for other area pubs, tales of frozen burritos labeled “in case of inspector,” pitches for karaoke, and were pointed to a lone rack of potato chips. Finally, exhausted from the search for hot dogs in dark places, we settled at Andy’s Old Port Tavern with a basket of popcorn and their full pub menu. Eating at some of Portland’s oldest, classic, grittiest bars is comparable to hitting the freezer case of the 7-11 on your way home after a bender: not something you’d do in broad daylight, but satisfying, albeit sodium-laden. This winter, consider visiting bars you might not otherwise frequent, but eat at your own risk. Originally published in DigPortland on December 10, 2014. We're trying something different with our educational programming at work with our new workshop series, From Scratch: Your Maine Kitchen. After the great success of food blogger and author Marisa McLellan's of Food in Jars demonstration in August, we hope to keep the momentum rolling with cookbook authors and local experts presenting on various Maine foods. So far, we've had two workshops; in November's "From the Maine Wild," author Kate Krukowski Gooding talked about cooking with wild game and prepared a delicious beaver Bourguignon. The recipe is in her most recent cookbook, 50 Ways to Eat a Beaver (and don't worry, she is aware of the wink, wink meaning of the title!). Master Food Preserver Karyn Small, who owns Butcher Boys Deer Cutting in Bowdoin, talked about preparing venison and offered samples of her venison jerky. There were a fair amount of hunters in the class, but as someone who doesn't hunt, I loved being able to try wild meats like beaver and deer. I taught December's workshop, with my friend and Master Food Preserver Allison Carroll Duffy making an appearance to promote her cookbook, Preserving with Pomona's Pectin. 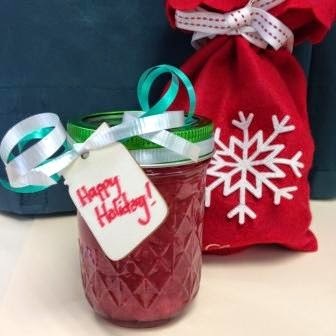 We made one of Allison's recipes, spiced cranberry pear jam, in this Holiday Gifts from the Kitchen class. Running with the cranberry theme, we also made cranberry granola (recipe below), and a cranberry pilaf mix in a jar. The gifts together would make a lovely basket for a friend or, individually, great host/ess gifts at holiday parties. Next month, Saturday, January 17th, we have friend of Extension Sheri Fistal teaching us how to make sourdough bread. We'll be baking bread, and everyone will go home with some sourdough starter. Michael Scholz, the miller at Maine Grains, will also be there to tell us all about flour and how it relates to baking - sourcing, storing, different kinds, gluten levels, etc. In February, we're learning about winter seafood and seaweed. We've got three instructors lined up: Barton Seaver, a local cookbook author and sustainable seafood expert; Hillary Krapf, seaweed enthusiast; and Maine Sea Grant's Sarah Redmond. I'm looking forward to seeing what "seaweed comfort food" recipes Hillary serves up. 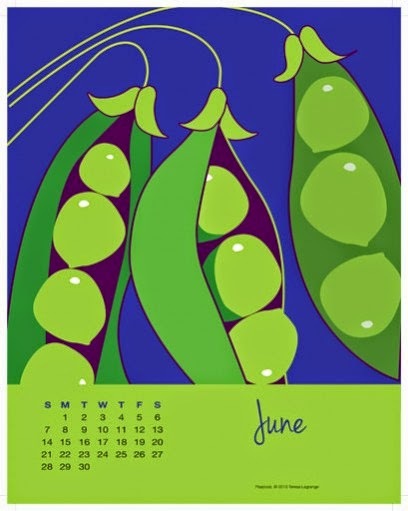 Other From Scratch topics include "Weird" Maine Fermentables (goat's milk yogurt, water kefir, and tempeh) in March, Maine Cheese Pairings in April, Maine Foraging in May, and Drinking the Harvest (Fall 2015). Workshops are Saturdays from 10am to 1pm and cost $40. Registration is available online. Hope to see you! Preheat oven to 300°F. Coat cookie sheet with cooking spray. Combine all ingredients, except dried fruit, on cooking sheet. Bake for 30-35 minutes, stirring every 10 minutes. 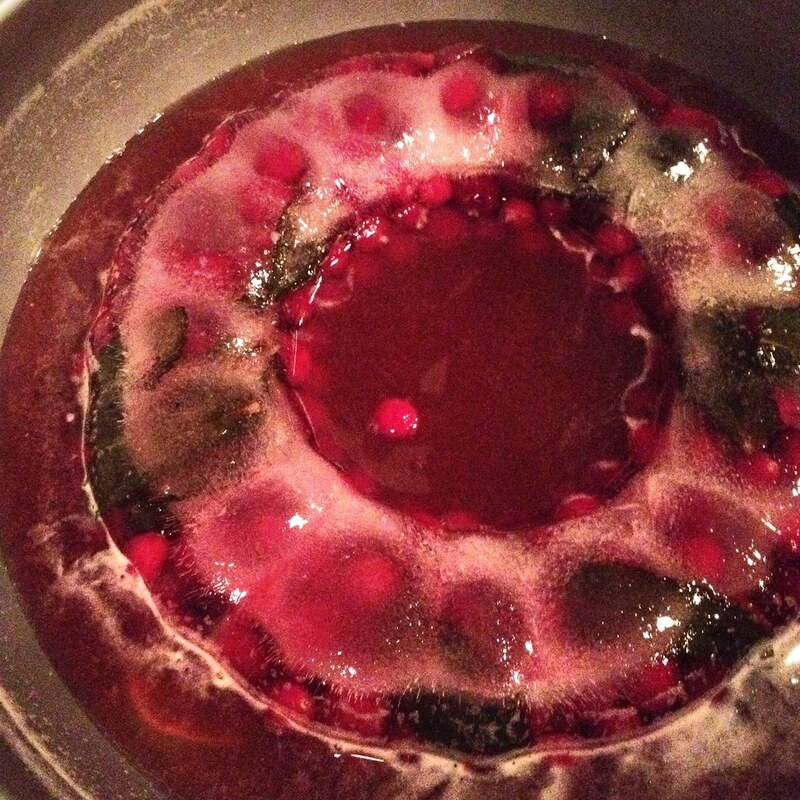 Once cooled, add the dried fruit and mix well. Store in an airtight container. Last Wednesday, I daytripped down to York, Maine and had a delightful peek into the spirited life and business of the Woods family. Dave, his son David, and daughter-in-law Amanda run Wiggly Bridge Distillery on the main strip in York. 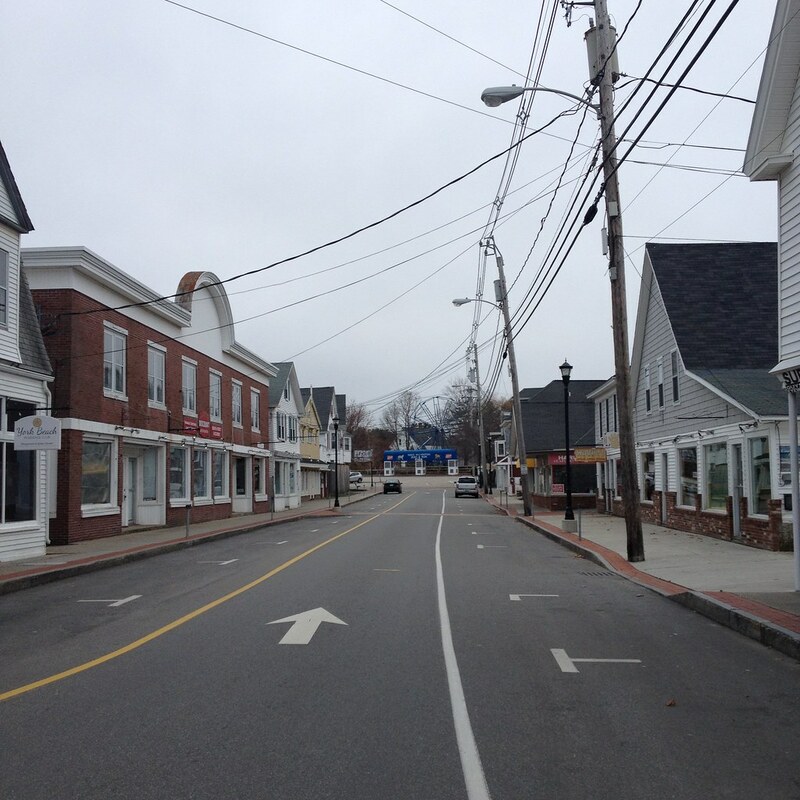 The town was quiet when we arrived, all shuttered for winter, although the faint smell of popcorn still wafted on the cold air. Woods later remarked that you could "fall asleep in the middle of the street," this time of year. 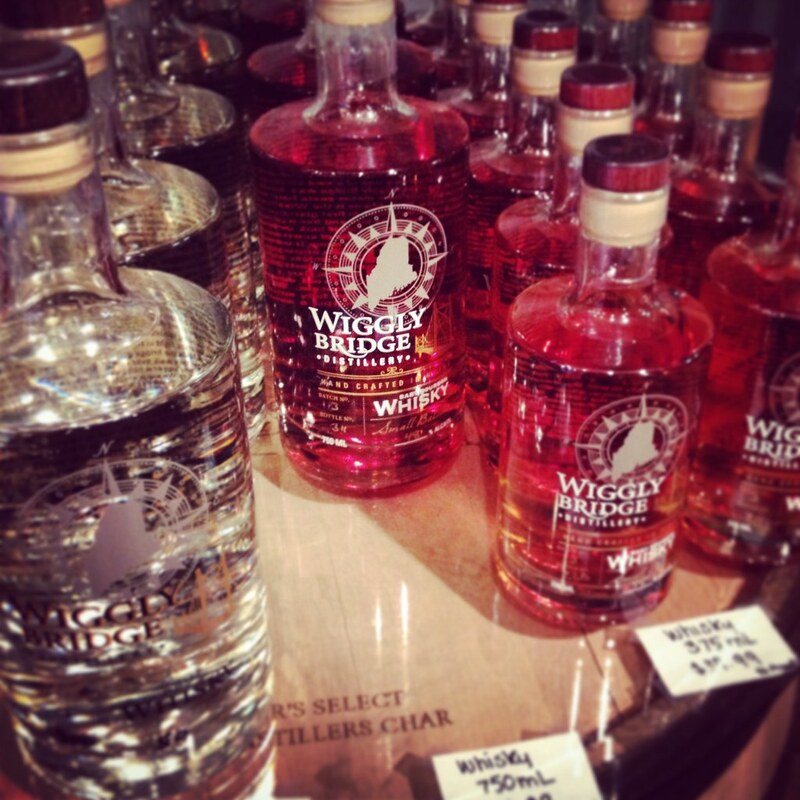 Wiggly Bridge Distillery is in a small storefront on Railroad Ave. in York, otherwise surrounded by a hair salon, t-shirt, taffy, and popcorn shops. The Woodses have been making and selling their spirits from their storefront since July, with a homemade still and self-taught knowledge on making bourbon, whiskey, and rum. David and Dave make two whiskeys currently: a white (or unaged) whiskey and "Baby Bourbon" whiskey, aged 10 months. Other whiskeys have been tucked into charred oak barrels and are currently aging, some to be opened as soon as January 2015, others at least not until 2016. There's two rums as well, a white rum and an aged rum, with an extra-aged rum almost ready for bottling. We plunked down on some bags of grain and chatted with the Woods family about their arduous work of opening a distillery on the main street of a town that banned state-owned agency liquor stores in the late 80s. Woods now operates under a craft distilling license, allowing him to produce a certain number of gallons annually and sell them out of his retail shop that also stocks plenty of Wiggly Bridge Distillery swag. Owning several service-based businesses, like car washes, a campground and a salon, Dave found himself for the first time producing stuff, something to stock on shelves and sell. But his background designing and modifying car wash equipment gave him an advantage when he decided to build his own copper still (while on vacation in Montserrat, naturally - why not take advantage of the local knowledge of Caribbean rum?). I was particularly impressed by the sheer amount of perseverance Dave displayed in his pursuit of opening the distillery, from slogging through federal code books 5 inches thick to installing new sprinkler systems to bring his storefront up to code to honing his skills to create quality spirits. Before we left, we had to sample the stuff, of course. We tried the 2 whiskeys and 2 rums currently for sale, as well as a preview of the barrel-aged rum that will be ready next year. Unaged spirits are a bit hard for me to drink on their own, but I could see that the corn whiskey would add a unique taste to cocktails; Dave recommends it in a Bloody Mary in place of vodka. The Baby Bourbon was my favorite, and a bottle came home with me for the holiday the next day ($39.99 for a 350ml bottle). At only 10 months old, it's remarkably smooth, with a great balance of warm flavors like cinnamon, but some remaining spiciness from the rye mash. Before we left, Dave mixed us up a sample of a Marmalade Manhattan, recipe below. I typically do not go-to Manhattans, as I find them to be too boozy and too sweet. Serving this one over ice, as opposed to neat, still gives nice citrus and spice flavors, but results in a drink that is much less "stiff" that the traditional one. Wiggly Bridge's products are slowly making their way into Portland bars, but can be found at the distillery, 19 Railroad Ave. York, from 12-7PM, Thurs-Sun. Add marmalade and whiskey to cocktail shaker. “Melt” marmalade with whiskey by swirling shaker. Add ice and remaining ingredients to shaker. Shake vigorously, strain into a rocks glass filled with ice.